Realistic, painted veins can transform your Halloween costume from slightly spooky to completely frightening. 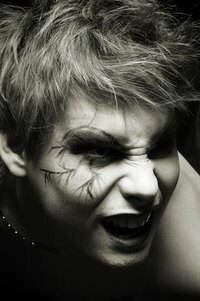 Whether you are dressing up as a zombie, vampire or witch, painted veins can add the finishing touch to your costume. Realistic veins can be created with some basic techniques and a few supplies, which can be found in most costume shops. Even if your artistic ability is limited, you should be able to easily paint realistic veins on your arms, legs or face. Dip your fine-tipped paintbrush into your blue face paint. Wipe any excess paint on a paper towel. Draw a fine, crooked line on to the area where the vein is going to be. Draw branches off of the first line in a lighting bolt pattern. Dip the brush into the face paint to obtain more color, as needed. Dip your paintbrush into the purple face paint. Wipe the excess away from the brush, using a paper towel. Trace over the blue lines drawn in step two, using the purple paint. The line drawn in purple should be the same size or slightly smaller than the line drawn in blue. Dip your paintbrush into the red face paint. Blot the paintbrush onto the paper towel, until only a small amount of pigment remains on the brush. Trace over the blue/purple lines drawn in steps two and four, using the red paint. The paintbrush should only add a small hint of red. Blend the edges of your painted veins by smearing them slightly with a cotton swab. This will help the edges of the veins appear as if they are receding into your skin. Dip your large paintbrush into the baby powder. Tap any excess baby powder onto a paper towel. Tap the baby powder-covered brush onto your painted veins. This will help dull down the bright colors of the veins, and will create the appearance of a thin layer of skin stretched over the veins. Tap as little or as much baby powder as you desire to complete your look.